Whatever your opinion of Kid A might happen to be, you simply must admire the courage of Radiohead. Sure, the group scored unprecedented success with the sprawling science-fiction opus OK Computer, but it was anyone's guess as to just where the band would head next. The answer, of course, is further inward towards something so far outside the mainstream that it's delightfully puzzling how this album managed to debut at the top of the charts. Lead singer Thom Yorke has never been happy with Radiohead's early albums, which largely contained generic '90s rock. Since then, he's pushed the boundaries significantly, and call it what you will — creative genius or blatant self-indulgence — his aural visions can only be viewed as a good thing for those tired of the standard FM-radio fare. Kid A adds another chapter to Yorke's bleak view of the not-so-distant future of mankind. Where OK Computer examined the Big Brother aspects of the new millenium, Kid A buries itself in a nightmarish vision of human cloning and endless conformity — something of which Yorke is deathly afraid, and which no doubt explains his band's triumphant dive into the unknown. 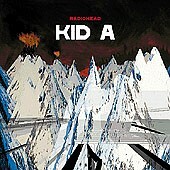 Yorke's world is cold and heartless, and on Kid A, Radiohead serves up music that only enhances this mood. Everything in Its Right Place opens the album, and its bleeps and whistles sputter, crackle, and swirl amidst a heavenly sea of electric organ and synthesizer. From the futuristic folk pop of How to Disappear Completely to the space-rock instrumental title track, the band conjures sounds and images that are as utterly beautiful as they are demonically haunted. Yorke sings far less on this album, and when he does open his mouth, words burst forth with an aching need to float free from the claustrophobic confines of the music. His vocals yearn for something unattainable, swimming upstream against the heavy current of the songs. Kid A is available from Barnes & Noble.